Researchers at ASU have been studying the water and agriculture in central Arizona, talking to farmers about how to keep their industry on a sustainable path. Central Arizona has a rich history of agriculture, contributing $9.2 billion toward the state's economy. That water has near-absolute power in determining the region's fate is not an over-reaching assumption. With increasing urban development and an uncertain climate, is this industry doomed or can it be sustained? Researchers at Arizona State University have been studying the issue, talking to farmers about how to keep their industry on a sustainable path. They argue that a mutually inclusive and ongoing conversation among the agricultural community, urban residents, water agencies and policymakers is necessary if the region would like to maintain an agrarian footprint in the future. The research, supported by the National Oceanic and Atmospheric Administration and the National Science Foundation, is one of few that have examined the vulnerability of irrigated agriculture to uncertain climate and unrelenting urban development, according to lead researchers Hallie Eakin, associate professor in ASU's School of Sustainability, and Abigail York, associate professor in the School of Human Evolution and Social Change. Population growth in central Arizona has forced researchers, water resource managers and policymakers to turn their critical eye to the distribution of the region's finite water supply. 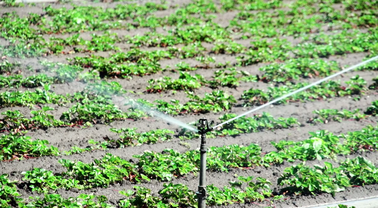 More often than not, the spotlight is focused on water used by agriculture. Many may not know it, but Arizona ranks among the top producers nationally for a variety of crops, including cotton, alfalfa, hay, lettuce and citrus. According to a 2010 report released by Arizona Department of Water Resources, agriculture in Maricopa and Pinal counties accounts for 47 and 96 percent of water usage within the counties, respectively, while the agricultural output in Maricopa County is second in the state, followed by Pinal in third place. The researchers say that policies instituted by the Groundwater Management Act in 1980 have been successful in reducing pressure on groundwater resources by shifting farmers on to Colorado River water through the Central Arizona Project (CAP). "Central Arizona farmers have traditionally been shielded from variable and extreme climatic events – a condition that will be harder to sustain in light of recent climate studies that show that surface water sources, including rivers, lakes and streams, are less reliable than previously assumed," York said. The scientists found that most farmers in the region are educated, motivated, entrepreneurial producers who are eager to learn more about water conservation and irrigation improvement programs to ensure that agriculture remains an integral part of the state's future. Yet, they feel they lack a voice. "Farmers say their needs are not valued as much as those dealing with urban demands," Eakin said. "Key players need to be asked pointed questions regarding what is desired and why, and the pros and cons of retaining an agrarian footprint in the region." York said that conflicts along the edge of cities are likely due to a lack of understanding of agricultural activities. Better outreach and education of urban residents about the nature of agriculture could help resolve the issues. "The agricultural community also believes that federal environmental policy and agencies are in direct opposition to its best interests and future," York said. "Hence, it is critical to identify opportunities to communicate farmers' concerns to policymakers and agencies, and vice versa, for a peaceful coexistence." Eakin calls the assumption that agriculture will and should give way to urban development, "premature." "States all over the Southwest are facing a similar situation," she said. "A bigger picture that takes into consideration the benefits of agriculture, including food security, revenue, jobs and heat island mitigation, would help to inform the decision-making process that will ultimately lead to central Arizona's sustainable future."